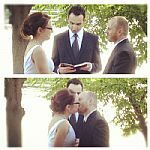 USA the Middle : Minnesota : '12 June Wedded Bliss! Home • USA the Middle • Minnesota • '12 June Wedded Bliss! Click HERE and all the pictures will get big. DAK&L enroute, hour 3 of a 12 hour travel day, here at John Wayne, connection through Denver. We did a hair style and make-up preview today and we've got to say, Lookin' Good! We had some fun this morning throwing 'spinners', a part of the cone from the surrounding trees, off the balcony and watching them catch the breeze and spin their way to the ground. I did a few chores today, a bit of this and that at one point finding myself in the Hmong part of town where I got a Vietnamese sandwich at this place with a nice view of Saint Paul's Cathedral. Lona, Hartley, Charis, and Windy are staying at this handsome B&B in a town on Lake Minnetonka. They are having a great time and I'm very glad for that until Charis came down with a terrible puking illness and they took her to Urgent Care. She's ok, probably just a nasty stomach bug. While L&H were deciding what to do about Charis, Windy and I went out for dinner. Cleaning up the downstairs for the party tonight, all the beds get piled up and we have, drum rollll, The Princess and The Pea. Cynthia and Kaitlin got their hair done. We did a little more of this and that, and then went down to the venue. Awaiting the arrival of the guests. The current occupants of the river making their way downstream. Welcome Aboard, where the wedding party gets ready and the staff is preparing for the reception and cruise. And now I, Mother-Of-The-Bride, hand over the camera to my most excellent Angela. ...the rings .. do you take .. I DO! That was GREAT and now we need to do some Running. Lona, Hartley, and Charis made it out for a few days but had to leave before the reception. Cynthia, her mom, her dad, and her brother. Mike, his mom, his dad, and his brother. The Bride and The Groom, Husband and Wife. Once on board for the reception the kids got to have a go on the bridge. My gorgeous daughter and the Minneapolis skyline. My newly minted Son-In-Law! Lucky ME!! Yes to all my dear friends who helped me go shopping. Where, you ask, is my gorgeous perfect and totally comfortable brand new never worn Eileen Fisher blouse?! I forGOT it back at C&M's house and there was no time for the 90 minute round-trip return journey. I just Happened to have this top in the car. So bummer that I forgot my gorgeous blouse and lucky-dog-me for this 'at-least-I-didn't-have-to-wear-a-tee-shirt' top. Following are Kent's table shots. Missing are the tables of Mike's relatives, his band mates, and his pals from work. Maybe I'll be able to put them in later from someone else. Including Mike's brother Scott and his brother's wife Cheri. Robin and her boys James and Michael, and her daughter Kristy and Kristy's husband Saeed. Kent's brother David and his family, wife Kenlyn, daughters Laure, Sara with daughter Genesee, Rachael with boyfriend Ryan. Leaving The Ranch Bob and Desda dropped me off at the SF Airport where I spent the night waiting for the morning flight to Minneapolis. Roger and Sandy met me for dinner and it so great to see them. Thank you for coming out! Home • USA the Middle • Minnesota • '12 June Wedded Bliss!